This is a 2 part story. The first starts with me, slowly realizing that my book collection is not as big as I once thought. All in all I think there are about 600 books, which isn't bad, but only about a tenth of those are what I would consider "special editions" in any stretch of the word to justify a spot on the BUFFET. There are so many interesting book review sites, 5b4, Bint, which are dedicated to books alone with places like American Suburb, Lens Culture and Photo-Eye featuring a nice book review now and then, so, instead of trying to keep up with "real" reviewers and writers, (I'm just a scrapper), I have decided to let myself occasionally slip into broader waters, but will still try to embrace the hardtofind/notsowellknown/getthemwhileyoucan touch that has always and will always interest me. A logical extension of the special edition books that I like so much is, well, the editions. I realized that I have a nice collection of works that have accompanied many of the books I have purchased and traded over the last 15 years. 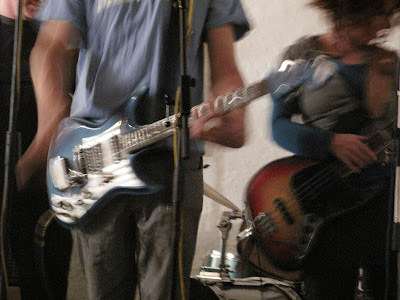 The second part of the story is the story of the blue guitar. 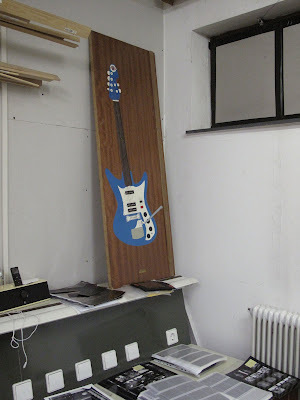 This blue guitar, "A Portrait of My Guitar, 2002" by Stephen Mathewson is the first piece I want to feature. Steve's painting in the darkroom. 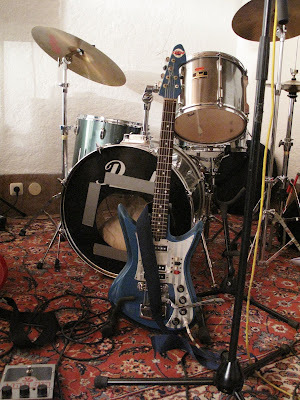 It is Steve Mathewson's Teisco Del Rey guitar that has been a part of his music making for a long time. Steve is not only a painter, but the musical master mind behind such bands as The Blitnikoffs, Rat Farmer, and most recently, The Brain Managerz. I can really recommend going to the BM link and listening to a bit of low-fi fun, my favorite is Golden Star, but I think the late nights of seeing it live have sweetened the music for me. But, this is about Steve's guitar. We traded work years ago, I don't know anymore what picture he got from me but I know I got the better deal. This is a 1:1 painting on wood of Steve's guitar. It is painted on the inside of a closet door, just like the place I hung many of my teenage heroes, starting with Van Halen and Kiss, Black Flag and The Vandals eventually giving way to The Cure and Michael Stipe. The closet door housed a skateboarding sticker collection and the outside edge was scored with pencil lines marking my growth from childhood to adolescence. The closet door defined my "space", so it felt right to put Steve's guitar in my darkroom. My darkroom is about the same size and shape as my childhood bedroom and heaven knows I spend a lot of time dancing in there by myself, just as in my old bedroom. 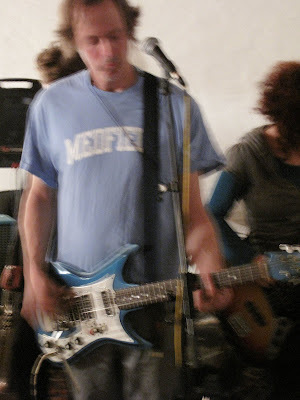 Here is Steve, and the blue guitar, in action.